Studio Design by Ewa, specializes in Dog and Cat breeder web design, developing unique custom designed web sites that are fast loading, easy-to read and professionally designed by an Artist. I have been building dog breeder websites since 2001 and have gained world wide reputation in this field. I " walk and talk Bulldogs", my experience in the dog world as a breeder and show dogs owner brings a large understanding to the animal related web sites which I create with passion. Do not hesitate to contact me with any questions you may have! The Ovulation pads are easy and convenient to use as well as cost effective. No more blood tests at the Vets! Lots of positive results and great feedback. Good and effective service, if needed you will receive plenty of help from Karen to achieve success! 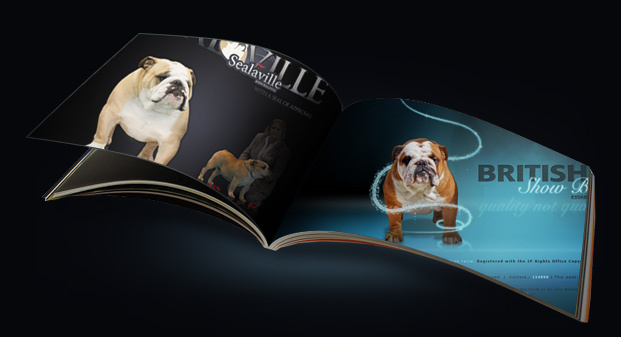 The Bulldog Breed Council Website provides a lot of interesting Bulldog related information. How to rescue a Bulldog? Go to the Bulldog Rescue UK website . There you will find information about Bulldog Rescue, how to apply to adopt a dog and view dogs that are looking for homes.